Iban Navarro was born in Barcelona, Spain in 1982. Son of Spanish hyperrealist painter Jesús Navarro, Iban first became familiar with painting in his father’s workshop and began learning various painting techniques from a young age. Among all the painting techniques he learned, Iban favored watercolors as his primary materials and mixed them with other substances, such as acrylics and oily pastels, which allowed him to achieve a better consistency for the realism found in his works. Iban pursued academic training at the famous school of drawing in Spain, Escola Joso, Centro de Cómico y Artes Visuales (The Joso School, Center for Drawing and Visual Arts). In 2002, at only 20 years of age, Iban debuted his work in a group exhibition at El Corte Inglés, where he cultivated great expectations and good reviews. He has since continued to exhibit in his native Spain and internationally while improving his techniques year after year. Iban is skilled in the manipulation of the medium in each of his works. His photorealistic compositions are completed with egg tempera and watercolor on paper, by a method of mixing watercolor with egg yolk, occasionally adding oil pastel. Although this is an ancient technique, few artists have been able to master the unforgiving nature of tempera, as it dries the second it is applied to the paper. 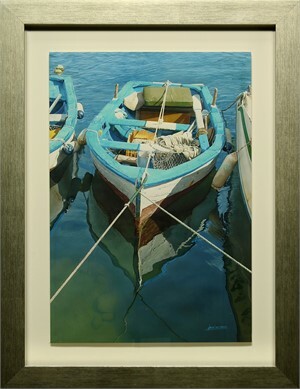 One of his most recognizable subjects are the boats floating on hazy and transparent waters, small fisher ports, and still figures by the sea, though he is capable of realizing a vast range of still life subjects and figure portraits as well. 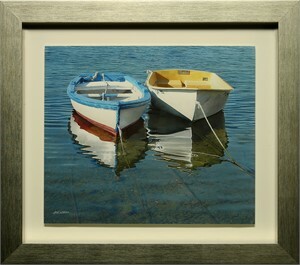 His profound seascapes capture the tranquility and emotional depth of the sea, whether it is through depicting boats bobbing up and down from the ocean’s gentle current or placing figures at the sea rocks’ edges as they contemplate the ocean’s enormity and mystery.